Candy is probably one of the things you’ve never attempted to make at home. Perhaps you’re concerned about burning sugar or think you need a candy thermometer. Perhaps it’s easier to just go buy it. Well my friends, if you wish to change your mindset, here is a super easy candy recipe for you to try! My shortcut is to use the microwave to cook the sugar into a delicious caramel. As microwaves vary in power, please keep your eyes on the sugar during the second half of the cooking process. Remove the sugar from the microwave once it reaches a light honey color. (It will continue to deepen in color as it cools.) As I mentioned in the video, prepare all the ingredients and utensils ahead of time and have it ready. You have a very short window when working with caramel and so will need to work quickly. My favorite flavor trio is peanuts, sesame seeds and coconut flakes but feel free to use any nut or seed variety you enjoy! 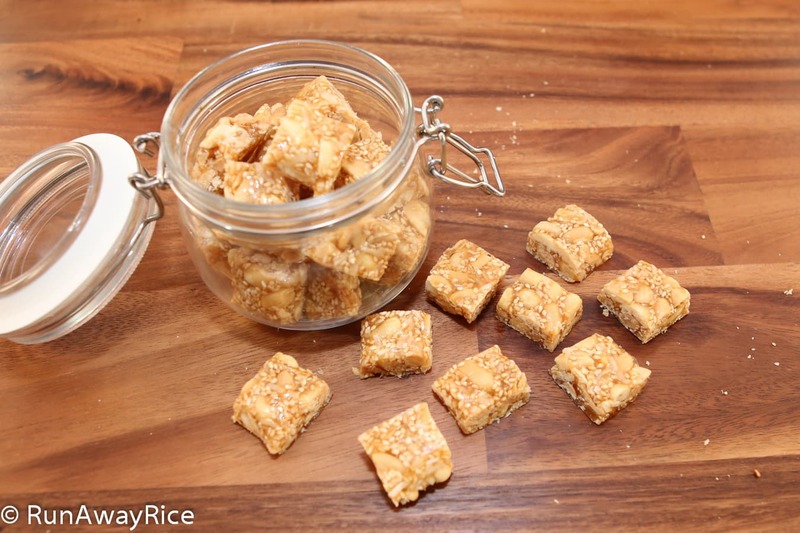 If you enjoyed this recipe, you may also like: Chewy Sesame Peanut Candy (Keo Me Dau Phong) and Candied Orange Peels (Mut Vo Cam). Sprinkle 1 tsp of sesame seeds into the dish. Set aside 1 tsp of sesame seeds in a separate bowl to use later. Oil a large spoon with some of the vegetable oil and set aside. Add peanuts, sesame seeds and coconut flakes into a bowl or measuring cup and mix together. In microwavable bowl or measuring cup add the sugar, water and lemon juice. Microwave on High for 2 minutes. Swirl sugar around in bowl for 10 seconds. Return to microwave and cook on High for another 2 minutes or until the sugar is a light honey color. Add the nut mixture and quickly stir together coating everything evenly with the caramel. Pour into baking dish and quickly press into the dish using the oiled spoon. Sprinkle remaining sesame seeds on the top. Work quickly as the candy hardens very fast. Allow the candy to cool for 10 minutes. While candy is cooling, coat a large knife with the remaining vegetable oil. Remove candy from dish and cut into thin strips, approximately 3/4 to 1-inch thick. Then cut into bit-sized pieces. Allow to cool completely before eating. Store any uneaten portions in an air-tight container. How can I buy online for this peanut candy? My colleaques brought some back for me to try, & I fell in love with it. I am not sure where to buy this online but it’s really easy to make. I hope you give my recipe a try! Thanks for a great recipe. I had never thought it would be that easy to make the caramel. I made it tonight and after mixing the nuts (I used cashews, almonds, peanuts & sesame seeds – yummy!) into the caramel I spread the mixture on a wooden cutting board sprinkled with sesame seeds then topped with the remaining sesame seeds. When it was just cool enough to handle, I put a piece of saran wrap on top to press it into shape and then cut it right from there. It was much easier than pressing the sticky mixture into the baking dish lined with wax paper as the wax paper would keep moving…Thanks again for the marvelous recipe. I love your mix of cashews, almonds, peanuts and sesame seeds! Yummy! Appreciate you sharing your tips using the plastic wrap–marvelous! Can this candy be made with only peanuts? Can I leave out the lemon juice? Does the candy taste lemony? You can make this candy with all peanuts. The lemon juice to is prevent the sugar from recrystallizing so I do recommend it. It will not taste lemony. Good Luck! Thanks so much for your response. I look forward to trying the peanut candy recipe. I have been purchasing candy like this at our local Chinese restaurant and I love it. Your videos are great. So easy to follow and helpful. I am glad that I found your site. I look forward to making more of your recipes. I am a vegan. Does your tofu recipe use the silken tofu? I am glad you to hear you’ll give this recipe a try and I hope you love it. Regarding my tofu recipes, I use a firm to extra-firm tofu as it holds up better when stir-frying. You can always uses a softer tofu if that’s your preference and you’ll have to be extra gentle when stirring it. Happy Cooking! Hi! I made the candy and it tasted great. I used just peanuts, over 2 cups. The syrup got a little harder than I would like. Should I next time cook it perhaps 2 minutes and then 1 1/2 minutes? Would that make it a little softer? What would you suggest? I don’t want to break a tooth. My microwave is 900 watts. So it isn’t really a high powered unit at all. Thanks for everything. Love your blog! It is a hard candy and I don’t want you to break a tooth! 🙂 If you’d like to make a softer, chewier version, add 1/2 cup of water + 2 Tbsp water chestnut flour or tapioca starch. You can melt the sugar until it turns a golden color so adjust according to your microwave’s power. I hope you’ll give it a try and let me know if you like this version better. Thanks for stopping by! Do I make the recipe like before, but instead I add a half cup water and 2T flour to the sugar and then cook in the microwave like before? I am not sure where you live but you’ll find both water chestnut flour or tapioca flour at an Asian grocery store. (You can also find tapioca flour at a health food store). Dissolve the flour or starch in 1/2 cup water. Add to the sugar/water/lemon juice mixture and microwave. Good Luck! I really really enjoy your peanut candy recipe. It’s super simple and easy. Myself I love peanut candy a lot. My first time I made I used pecan instead of peanut because it was late and I only have pecan around the house. Well , just want to thanks very much for your super easy recipe. Thank you for sharing easy recipe , I made itI last night & again this morning, it is so simple to made, I would like to subscribe your blog thru email, do I have that option. Hi Anh, I happy to hear you like the recipe. The candy is too easy to make and so addicting! 🙂 You can subscribe to my RSS feed (last icon on the “Follow Us” section.) You can also subscribe to my Youtube channel and receive an email every time I post videos. Happy Cooking! Thanh you Trang, I only know how to subscribe by email, don’t have Google email, don’t know how to do on RSS feed, it would be nice if you can give the email option, I already made 5 times, every one love it, super easy but I measure from cup first then put on kitchen scale to weigh then every time I made, I just weight all my ingredient , can you share with us if you know how to toaste peanuts or any kind of by microwave. Thank you again for sharing wonderful & easy recipe. It sounds like you’re really enjoying the recipe! Thanks for the request for email. I will work on adding it to my website and let you know when it’s available. In the meantime, I post Youtube videos on Thursdays and recipes here by Friday. In the meantime, I hope you’ll check back regularly. To save time, I buy peanuts already roasted. If you would like to roast unshelled raw peanuts you can use the microwave. Here’s how: Spread peanuts out flat on plate or tray. Spritz the peanuts with oil and optionally sprinkle salt. Microwave on High for 2 minutes and then stir. Keep adding 2 minutes at a time and stirring until the peanuts are roasted per your liking. It may take up to 10-12 minutes depending on the power of your microwave. Happy Cooking! Thank you so much Trang, I checked your blog 2-3 times a day, I wiill share your peanuts candy to my cousin who lives in Ohio, he loves to bake & cook.